This pattern is super fun to knit and makes a very funny gift. 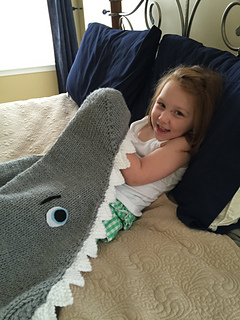 Only children’s sizes are given, but it is easy to adapt for adults if you just knit two sections a little bigger. Message me if you need help with this. You can choose to knit it back and forth like an afghan, or to knit it in the round like a cocoon or sleeping bag. As with all my designs, I have made a big effort to spell out each step and technique. I will be posting tutorial photos on my blog in early 2016, too. I am also available by email to help. The reason I say this is that so many who have only knit rectangular objects to this point ask how hard things are. 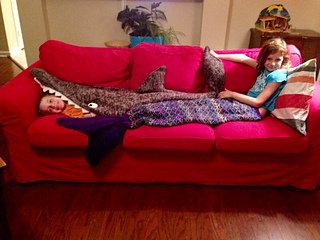 (Thinking mainly of my mermaid pattern now.) There some skp’s on this one, and a centered double decrease on the belly and the fins. But I explain it and offer links to videos. With the Internet, there is no need to worry. Demos are readily available. It is made holding 2 strands together throughout, with larger needles, so it works up pretty fast and has a nice chunky feel to it. I suppose you could try one strand of a chunky yarn instead. 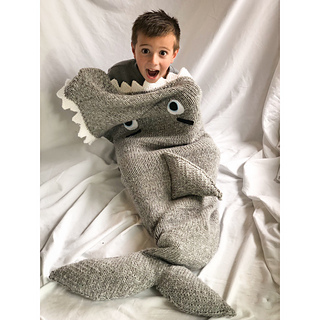 You start at the nose, and make the snout as if you were turning the heel of a sock, but if that seems too hard, I give an alternate way, though it ends up looking more like a fish than a shark. 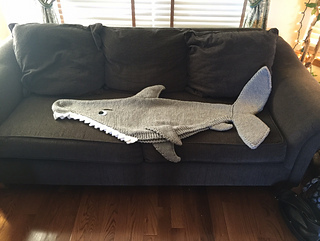 The tail fin is knit as a continuation of the body. 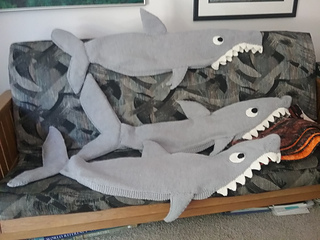 The other fins must be sewn on. I have 1/2 inch thick upholstery foam in the tail fin, but you can use fiberfill, if you prefer. The teeth CAN be knitted on, if you have knitted edging onto the edge of a shawl, but mine were sewn on after knitting them in a long piece. Now we have 9 stitches each side with gaps between them, and 8 (12) (16) stitches in the center. You should still have 26 (30 (34) total stitches. No increases or decreases in Rows 20 thru 39, either.